In the City of Sevenscore Thousand Smokes, danger lurks down every dark alley. Sinister Sorcerers summon terrible forces in their crumbling towers. The treacherous Thieves' Guild prowls the Plaza of Dark Delights. Assassins from the Slayers' Brotherhood work the Tenderloin District. And hunched figures skitter beneath the streets, waiting for their chance to rise. But there is action, adventure, and wealth here too - if your scoundrels have the skill and bravado to claim it. Lankhmar: City of Thieves is the core setting book for Fritz Leiber's world of swords & sorcery. 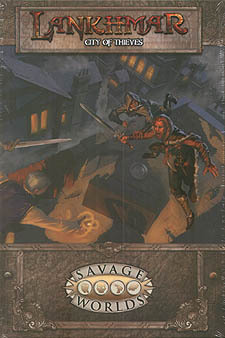 It contains details on the world of Nehwon and the city of Lankhmar, Setting Rules, Savage Tales, monsters and foes, and recounts the tables of the world's most notorious scoundrels - including Fafhrd, the Gray Mouser, and their sorcerous sponsors.